We are having a late spring here in the northeast, which is a good thing because it gives me a bit more time to get winter chores done. 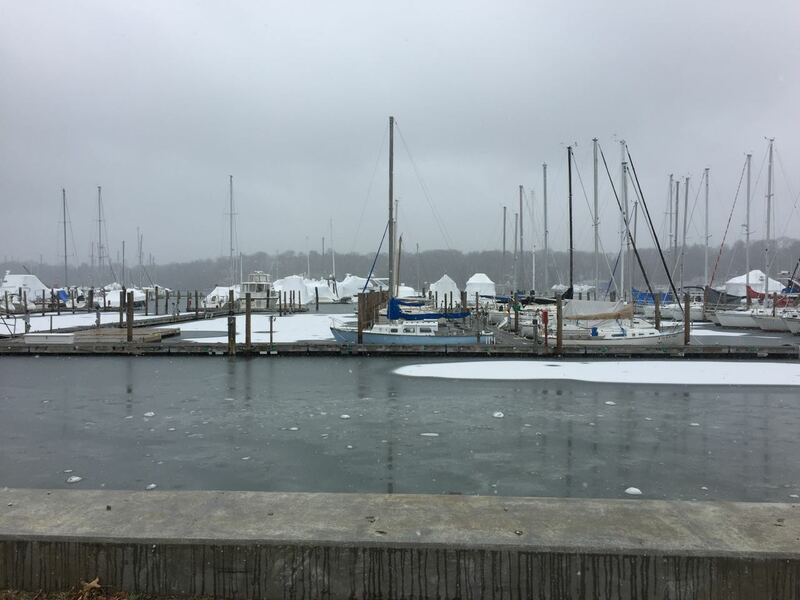 Here's what Huntington Harbor looked like on the first day of Spring. Cheery, eh? On the project front, I'm finally gearing up to get my bowsprit done. I've got the wood (more on that next time) and am just waiting for a break in the weather to get started on that project. In the meantime, I've been getting ready. One thing I needed last week was a metal-working vice. I have an old vice, stamped 1913 on it, which has been mounted on one of the rickety little tables in my shop. Between it's metal jaws and unstable platform, it was next to useless for woodworking, but I made do with it for many years. 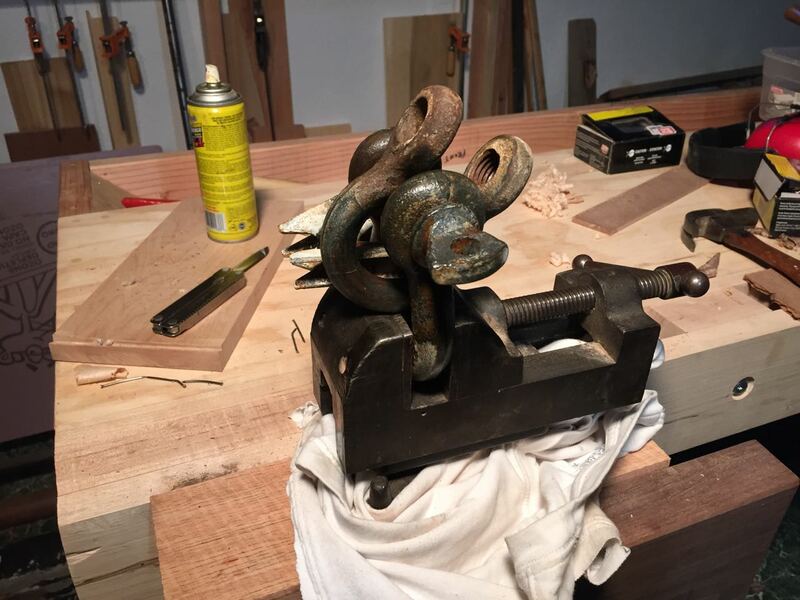 Now that I have a good wood vice, and have experienced the bliss of working on a bench that doesn't move, I was determined to do something with my metal vice. But bolting it on to my bench wasn't an option. It would be too much in the way, and there was really no place for it anyway. Luckily, I'd seen a nice trick somewhere, for turning a vice into a tool that can be brought out when needed and put away when not. To get started, I needed a good size hunk of hardwood. Something wide enough to mount the vice on. About 4"x4" would do. I didn't have an off-cut that size, but I did have some good chunks of seasoned firewood. So using the sled-and-bandsaw trick discussed last time, I quickly had it squared off. Not the kind of wood you'd want to build fine furniture with, but good enough for this job. 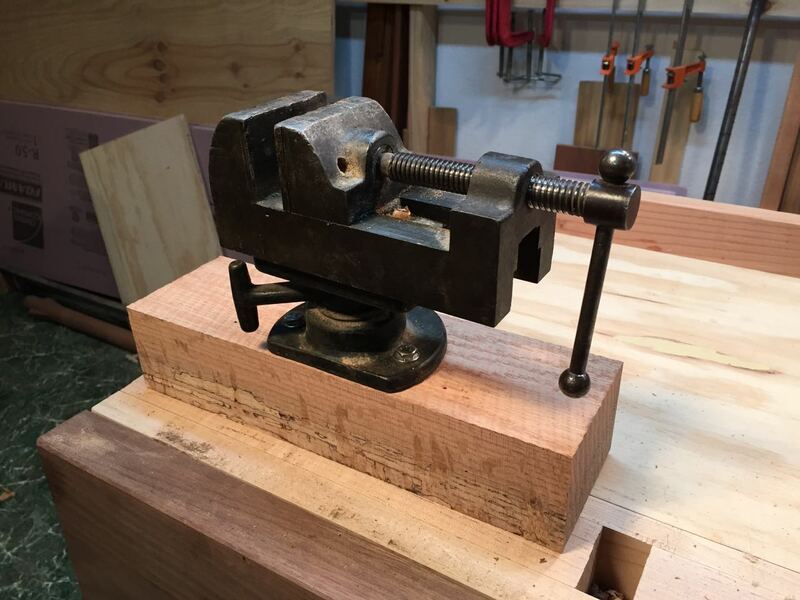 I bolted the vice to this block of wood using 2 1/2-inch lag bolts. I might as well have welded the vice to an I-beam. Real solid. 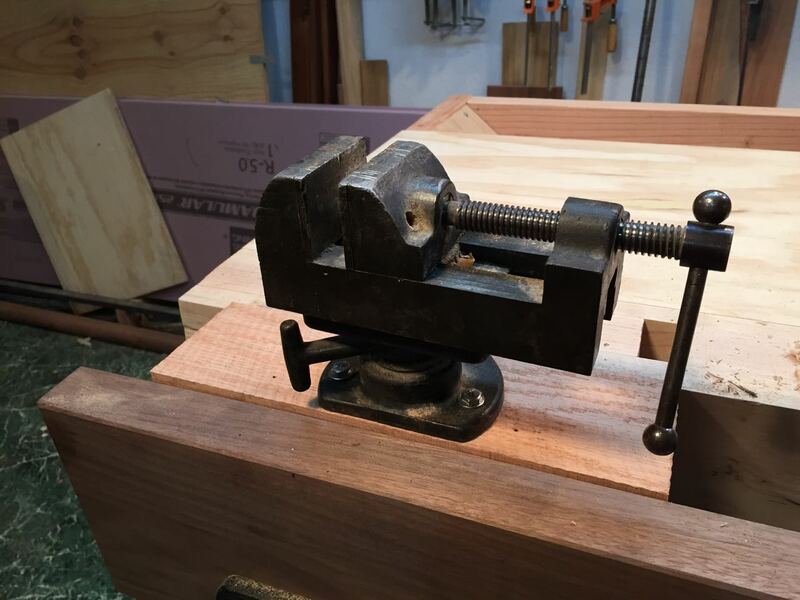 Then to use the vice, all I need to do is clamp the block of wood in my front vice. Why did I need a metal-working vice so urgently? A frozen shackle. I mean, it was really frozen. Still is, in fact! Even clamped in a vice, and bathed in Liquid Wrench, I could not get that shackle open. Complete and utter defeat. Frozen shackle -- still frozen!! Ah well, at least I have a good new tool. Next job: a new bowsprit. Also a matter of leverage ,very long wrench arm like at least 12" long such as a plumber wrench? Yes, I did try heating with torch, and I have a 2-foot long wrench... it's really frozen solid! Never heard of it, but I just googled PB Blaster and it looks interesting. Will try anything at this point! Thanks. Have you tried slipping a long pipe over the handle of a wrench for additional leverage? You can have some black pipe cut to length at one of the home stores. We've used this method often - sometimes it takes a 2- or 3-foot length -and it usually works like a charm. I've tried everything. I've given up on it at this point. Bought a new shackle for mooring ball. That one was too big anyway. If you fear the new shackle freezing as well, try using copper impregnated grease on it. Once the grease dries out or washes away, the copper particles left behind gives you a shear line to break the rusted bond apart in the future.